See what evil is up to with Vision! Playmation is the next step in the evolution of play, where digital gets physical and imagination gets real. Inter-connected products with embedded content let players step into the world of Marvel's Avengers! Control the adventures with wearable gear that lets users feel the battle and puts them at the center of the action. Playmation Hero Smart Figures fall into four categories: Tanker, Striker, Medic, or Blaster. Different types of heroes have different advantages in battle. Each Hero Smart Figure comes armed with two attacks to help in combat, plus a unique ability that can be earned for the Avenger Gear. Fight alongside a hero on missions or spar in freeplay mode to level-up and get the ability for the next adventure (Avenger Gear must be registered with the AvengerNet App - see packaging for app details). 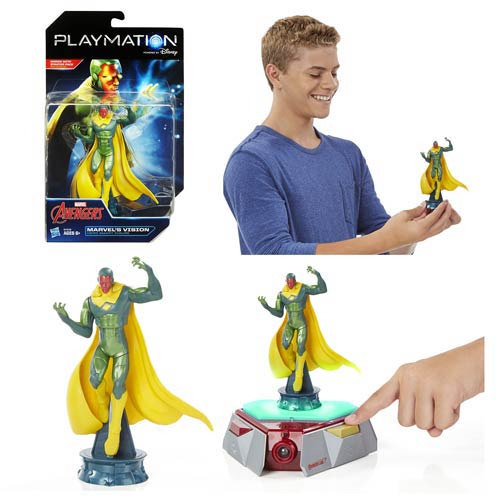 When the Playmation Marvel Avengers Hero Smart Figure is loaded on a Power Activator and connected to Avenger Gear (sold separately), the player can interact with the figure by practicing battle skills or teaming up to save Earth! Figures measures approximately 6-inches tall. Ages 6 and up.